This entry was posted in Featured, Government Documents, Press (Massachusetts) on June 6, 2011 by Ian. A backpedaling Gov. 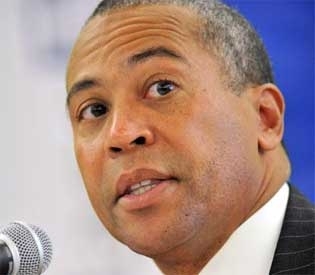 Deval Patrick refused to sign onto a national security program — already in place in Boston — that would target illegal immigrants who have already been arrested, citing concerns about its effectiveness and potential for racial profiling. Patrick said he would sign onto the program last December when the White House indicated participation was mandatory — but Patrick’s administration suggested that required involvement is up in the air. The letter, which Patrick’s administration sent Friday, also charges ICE officials with “sending conflicting messages” about the Secure Communities program. Patrick’s move comes as two other states pulled out of the program over the last few months. New York Gov. Andrew Cuomo said last week he was withdrawing from Secure Communities, saying it hasn’t deported felons. Illinois Gov. Pat Quinn decided in early May to bow out of the program, saying many of the people deported hadn’t committed a serious crime. Lawmakers in California are also pushing legislation that would withdraw the state from the program. The Secure Communities Program requires participating law enforcement agencies to share data on criminal suspects with federal immigration authorities. The Boston Police Department have participated successfully since 2006, and it’s meant to identify and deport violent criminals. 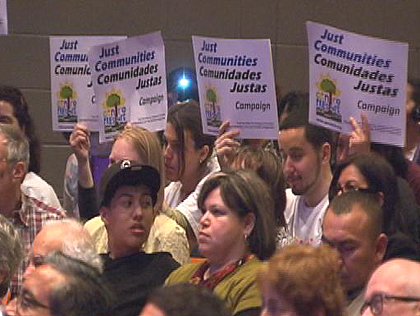 CHELSEA (CBS) – Hundreds of people came out to protest – loudly – against a proposed plan that immigrant advocates fear could break up families and cast too wide a net. The debate is over a federal plan known as the “Secure Communities” program. It allows local police to share the fingerprints of people they arrest for felonies with the FBI and the U.S. Department of Homeland Security. If the prints match someone who is in the country illegally, that person could be deported. Federal officials say they determine deportation based on the crime alleged to have been committed and on the person’s specific immigration history. The goal, according to Immigration and Customs Enforcement (ICE) officials, is to find and remove from the country illegal immigrants who commit serious crimes. The City of Boston has been a test city for the program since 2006 — and now, it is set to go statewide. That’s why so many people are coming out to voice their opposition, as they did at a Thursday night ICE information session at Chelsea High School. Vega and other immigrant advocates claim the program goes too far. The program is expected to be in use statewide by the end of 2013. This entry was posted in Press (Massachusetts) on April 29, 2011 by Ian.